If there’s one adage that’s applied in spades to Copperhead thus far, it’s “always leave them wanting more.” You can reckon safely that this is more than true of this ninth issue that’s dripping with Western flair while teasing conflicts galore down the trail. Better than that, it’s a visual tour de force that’s rich with characterization and tangible settings. 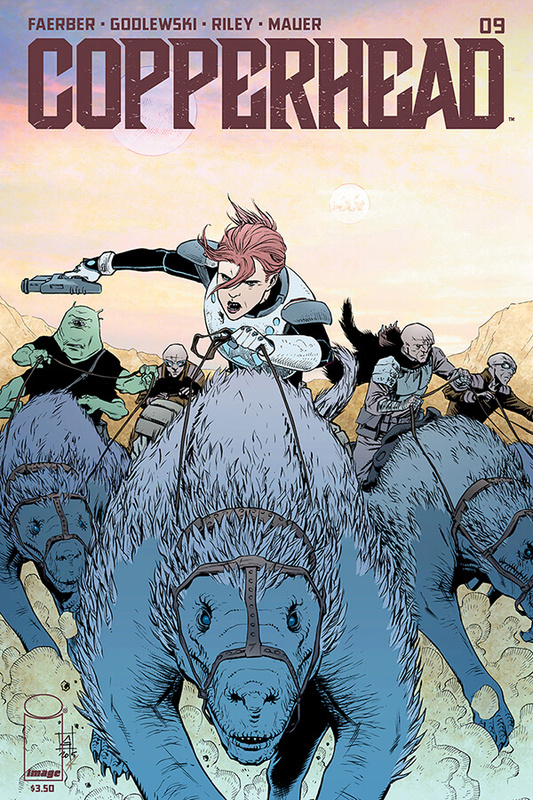 Copperhead #9 is a pleasure to read; a comic that rounds up its balanced posse of structure, characters, and tropes, and gallantly rides forever forward. It’s an old fashioned hunt for justice tale with grit and wry smiles. It’s an otherworldy exploration of social and class dynamics. Hell, it’s a story of bad guys, good guys, worse guys, not so-good good guys and the baddest good guy on the planet who just so happens to be a woman. Giddy up. “They got my deputy. Got no choice.” Clara Bronson is hard as nails, obviously, but beyond that (or perhaps because of that) she’s also damn good at her job. Despite her own tribulations with finding her footing as both a single mother and the new face of the law in the middle of nowhere, her moral compass never strays. Faerber keeps the focus on that driven, tunnel-vision Clara this issue as her ragtag posse is formed to go out and retrieve Boo. We’re getting the other side of the story we saw last issue, wherein Boo was being led about the dessert by his captors only to discover that help was on its way. Sort of. Faerber makes it clear that Clara was set to do it alone, her posse came to her and regardless of original intent she’s a natural leader/badass. The sense of not just duty, but a grander sense of loyalty and “right” is combined with all the classic “posse hunting the bandits” Western goodness that the straightforward nature of the storytelling is infectious. This issue’s script is largely plot driven, but Faerber subtly and naturally incorporated plenty of development for thematic subplots and characterization. There’s of course the continued look at Clara’s ability to trust, in this case Ishmael, which to be fair is pretty reasonable. Far more interesting however is seeing how Faerber is examining the nature of “arties”; or rather, if they have a nature outside their programming at all. If they’re all artificial, and comprised of essentially the same parts and programming, so how can you be radically different than the others? The obvious differences with Ishmael aside, Faeber thickens the “artie” individuality pot by having a moment of contentious disobedience followed by a selfless act of sacrifice. It’s all classic sci-fi metaphors for what makes us human and it’s done with such restraint here it’s hard not to eat it up. Some background information in case you haven’t been following this series: Scott Godlewski and Ron Riley aren’t just killing it on this book, they might as well be put up for war crimes. And together they absolutely OWN issue #9. While a quick perusal of this issue, carelessly thumbed through at the shop, might make it seem as though there’s a dearth of detailed backgrounds, the truth is that that would be painfully missing the point. Godlewski lets this issue breathe beautifully, knowing when to let the pages expand and contract by moving the perspective about to reveal the vast expanses of the planetary dessert overwhelm and knowing when to pull in tight when the tension needs to reach its highest apex or sharpest jab. Yes, ostensibly the vast majority of the issue takes place in the relatively barren dessert, save for the occasional rock arch, but Godlewski puts the sheer scale of that nothingness to work and in turn also successfully conveys its harshness. More so than merely having a firm grasp on the scope of the story, this issue could almost be read with all the dialogue removed because Godlewski’s art is so clean, precise, and evocative. The beats are controlled and his rendered facial expressions speak volumes; the distrustful side-eyes, the clenched jaws, the hurt yet determined “oh yeah, I’ll show you” wince, etc. The mannerisms from any distance and the tempo at which they’re interlaid are all a part of the language of comics and Godlewski speaks it fluently. A tilted panel amongst the standard stack to reinforce the jerked motion display within that panel? Good stuff. The double-page splash from a down-angle to place the reader almost underfoot of the thundering herd? Really good stuff. The compositional balance on each page, be it framing rock arches or a swift toss to safety stacked three panel action sequence? Great stuff. Ron Riley’s palette has been an impressive, glowing blend of primarily cool hues throughout most of the preceding issue, but this time out is all about the heat. Earth tones and warms abound, Riley’s skillful application of these gradients to the expansive sky is perfectly oppressive and mesmerizing. It’s an alien landscape, but an all too familiar feeling. After a brief introductory reprieve of visiting the cool alien sea-foam bathed offices of Lieutenant Ford, the flare of the rising sun atop the sponged magenta sky rises and never lets up. The flatter, but richly saturated characters stand out atop the more textured earth around them that draws your attention without feeling as though they exist on different planes. Riley is a large part of why the harsh surrounds are as effective as they are while still deftly controlling the lighting in each scene to allow for just the right amount of what little shadow there is to be found. The slight blurring effect to account for roused dust, the glare in Clara’s goggles and the way the sun completes nearly a full day cycle throughout the course of events are all the little touches that make this comic go a far, far way. One of the most essential qualities to telling a thoroughly compelling story is its ability to rouse the question, “and then what happened?! ?” Copperhead #9 will have the reader doing this before each flip of the page right up until the end – you guys, when do we get to see inside The Bastion?!?! Look, we know, the Western Sci-fi genre has been done a lot. Fine. Maybe you don’t even like Westerns, or you’re not into things set in outer space for some truly bizarre reason. Whatever, it doesn’t matter. Copperhead is in a league of its own. The only thing one needs to get thoroughly engrossed with what Faerber, Godlewski, Riley, and Mauer are creating is an appreciation for the craft of storytelling. Awesome characters, clever utilization of expected tropes, gorgeous visuals, and the tantalizing promise of even better things to come. What more can you do? Copperhead’s got my imagination. Got no choice.